Looking for Mike’s Golf Site? Mike Dugan has been lighting up stages and studios for over four decades. 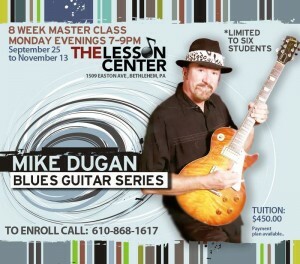 He is known up and down the East Coast as a master guitarist, bandleader, composer, and instructor. 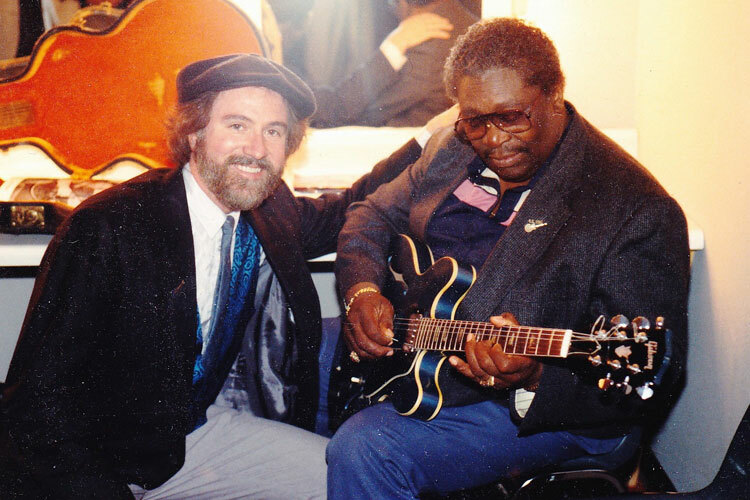 Mike has shared the stage with such legends as BB King; Robert Cray; Crosby, Stills, and Nash; and his personal hero, Les Paul. His albums have received worldwide critical acclaim, and his guitar mastery has won him a loyal international following. Once an audience hears Mike Dugan play, they never forget him! 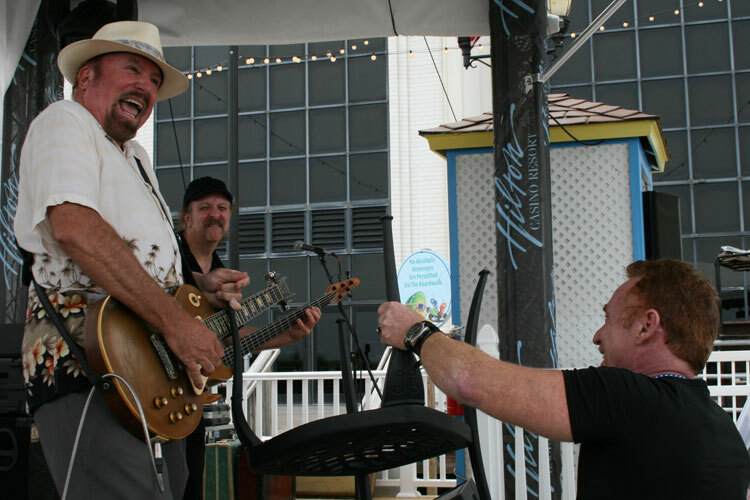 The ultimate showman: Mike at the Jersey Shore, playing slide with a chair held up by Danny Bonaduce! Mike's CLASSIC ROCK REVUE keeps audiences on their feet with guitar-driven rock favorites from the 50's, 60's and 70's! Our 2019 WINTER TOUR has been going great! Just a few more weeks before we have to pack up and head North. Catch us LIVE if you’re in Florida, or on our LIVE FACEBOOK STREAM if you’re not! THANK YOU for keeping QUALITY LIVE MUSIC alive and well!! It was an arduous journey South, and we landed in the pouring rain… but we MADE IT!!! We’re so grateful to be here, and playing at our favorite FL haunts for another Winter season. Whew! What fun! Thanks to all our friends and fans that came out to welcome us back, it sure made the holidays special for us. We’re taking a couple of days for some R&R, and then we’ll be right back at it! Busy filling up our calendar for the rest of the season, till it’s time to pull up our stakes again and head North in May. So come on out and catch us while we’re here, the time sure does fly by when you’re in paradise!! We look forward to seeing you this Winter!! HERE WE GO!! T-minus 30 days and COUNTING!!! PA/NJ friends and family, we have less than a month to go before we head out on the road for WINTER TOUR 2019! Fall has flown past faster than ever. We’ve had some great times with friends and family, and we’re really looking forward to our last few shows before we hit the long. long. road. Please come out and give us one more hug before we leave. We won’t miss shoveling snow. But we’ll miss all of you! LAST SHOW up North is GODFREY DANIELS on Dec. 8! FIRST SHOW in Florida is on Dec. 15 at 1916 Irish Pub in Plant City! Are we crazy? Maybe. OK, probably. Are we going for it?? Heck, yeah! Florida friends and family, we look forward to seeing you for the holidays!! If it’s Sunday, this must be…Wildwood! HERE WE GO AGAIN!! 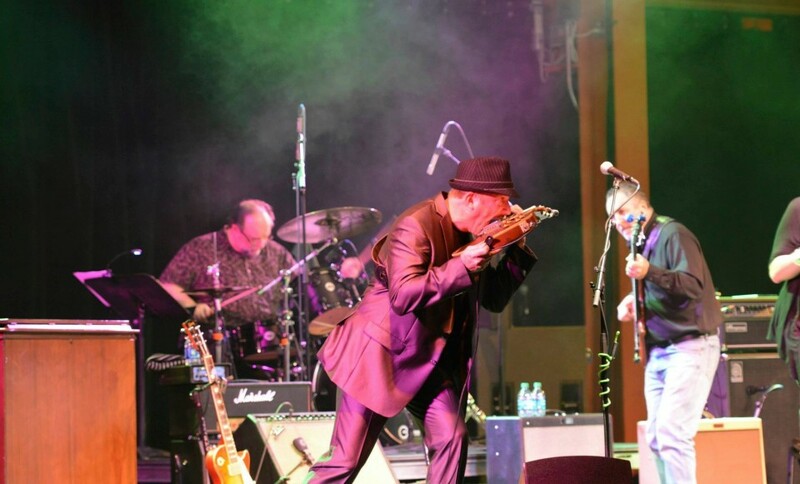 Another crazy Summer, playing in the Lehigh Valley AND the Jersey Shore… Catch us if you can! Turn it on and Light it up, let’s get this show on the road!! HEY LEHIGH VALLEY! WE’RE BAAAACK!!! What a long, strange trip it’s been… 18 weeks, 50 shows, 3000+ miles! But now we’re BACK IN PA for MAY!! Check us out at a local show SOON, we head back down to the shore for Memorial Day! CHEEK2CHEEK WINTER TOUR 2018 IS IN ITS FINAL WEEKS!! We’re extremely grateful to everyone who made this tour possible!! 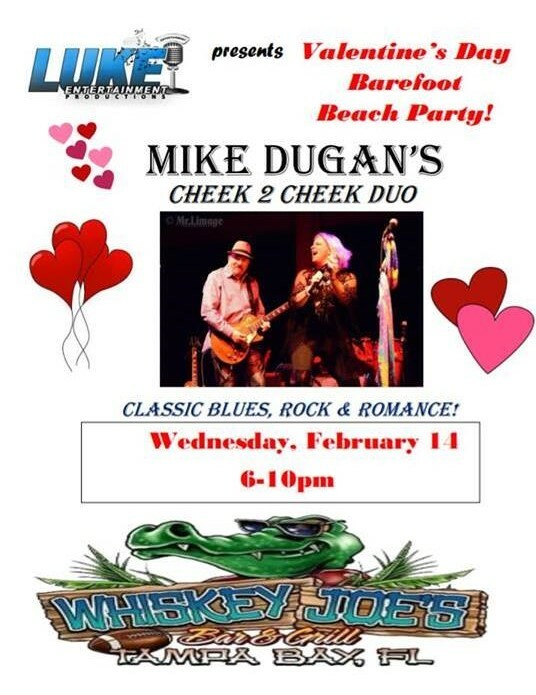 JUST ANNOUNCED: VALENTINE’S DAY BAREFOOT BEACH PARTY at WHISKEY JOE’S!! Grab your sweetie, hop on a plane and hit the white sand dance floor on February 14! What could be more romantic than THAT!! LOOK OUT FLORIDA, HERE WE COME!!! Cheek2Cheek Duo will be hitting the road in less than a week for our Winter Tour! 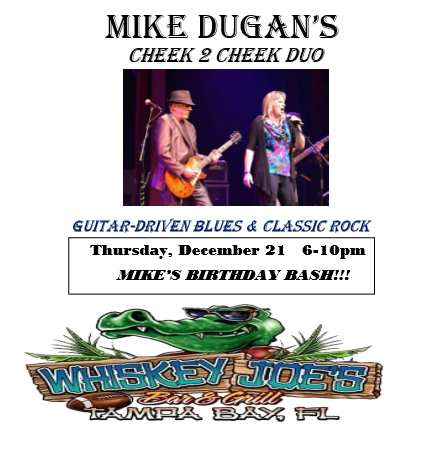 FIRST STOP: WHISKEY JOE’S BAREFOOT BEACH BAR on Thursday, December 21!! WOW!! We had a BLAST at HERITAGE WINE FESTIVAL 2017!!! 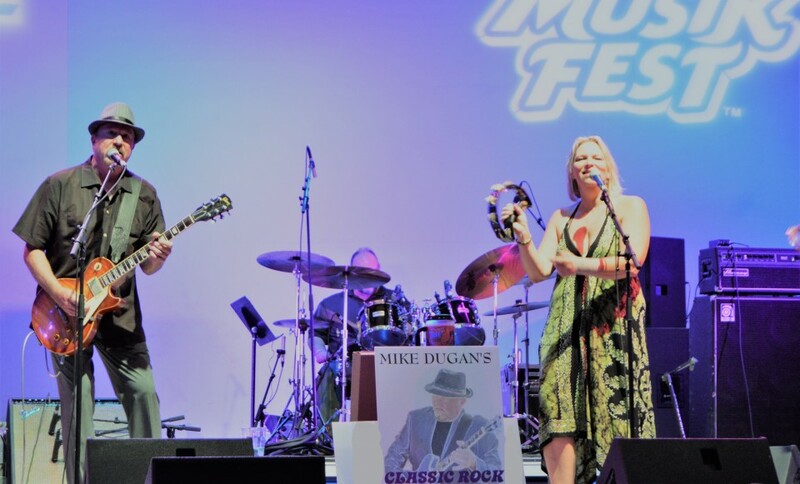 MIKE DUGAN’S CLASSIC ROCK REVUE rocked out and kept the party going for 2 days!! 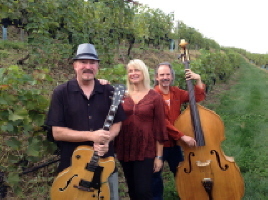 We’d like to thank our friends at Heritage Winery for having us back again! Two sold-out days in a row, over 5000 attendees, gorgeous weather, an awesome sound system, and oh yes, GREAT WINE!! We can’t wait for next year!! FALL 2017: FUN, FESTIVALS, AND A BLUES MASTER CLASS! Summer’s over, and we’ve got great things in store for Fall! Check out MIKE DUGAN’S BLUES MASTER CLASS at the LESSON CENTER in Bethlehem, PA! 8-week program designed by Mike, very limited enrollment! Starts Monday, September 25. Don’t miss out! Register now at 610-868-1617. 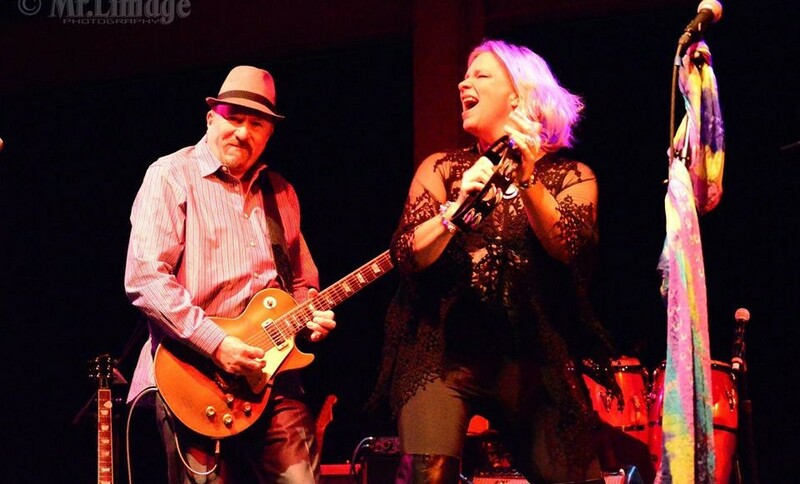 MIKE DUGAN’S CLASSIC ROCK REVUE will be headlining our favorite event of the year, the HERITAGE WINE FESTIVAL on September 23 and 24. We can’t wait to play our hearts out for two full days at the best family-friendly party of the year! Did I mention there’s wine?? Summer 2017: CHEEK2CHEEK at the JERSEY SHORE! That’s right, we had such a great time playing at the beach in FL all winter, we decided to take the duo to NORTH WILDWOOD for the summer! We’ll still do a few Lehigh Valley dates here and there(check our schedule), but starting Memorial Day weekend, we’ll be playing EVERY SUNDAY through Labor Day at the North End American Grill in North Wildwood, NJ. (The only exception will be our annual Musikfest show on August 13!) We love this place: very comfy, great staff and the best food in town! Make us part of your getaway plans this summer. See you on Sunday in WILDWOOD! CHEEK2CHEEK WINTER TOUR 2017 is coming to a close!! We’ve had a BLAST playing up and down the Gulf Coast for the last few months, but it’s almost time to pack up and head North for the summer. Check us out before we’re gone! We are gonna miss those gorgeous Gulf sunsets!! THANK YOU to all the fabulous folks we met on tour this Winter!! We’ll see you all in December! CHEEK2CHEEK DUO TAKES FLORIDA BY STORM!! … and we’re just getting started!! MONDAY, DECEMBER 19: GET UP CLOSE AND PERSONAL WITH MIKE DUGAN! O Come, All Ye Guitar Geeks! This is a very special INTERACTIVE CONCERT sponsored by the FAB LAB at Northampton County College in South Bethlehem. 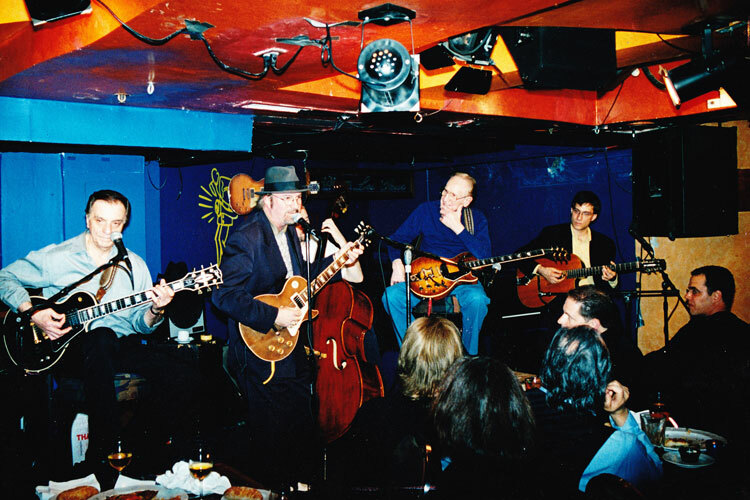 Mike will play several of his favorite guitars, tell stories from his career and answer questions from the audience. Mike will also be demonstrating several of the guitars built at the FAB LAB! A must see for all guitar buffs! Tix are $15 and going fast! WOW!!!! A HUGE THANK YOU TO ALL WHO ATTENDED OUR CHRISTMAS SHOW TO BENEFIT THE HOMELESS!!! We had such a warm and wonderful evening, and we raised a BIG pile of donations!! Many thanks to everyone who made this last-minute show possible. WE LOVED IT SO MUCH, WE DECIDED TO MAKE IT AN ANNUAL EVENT!!! 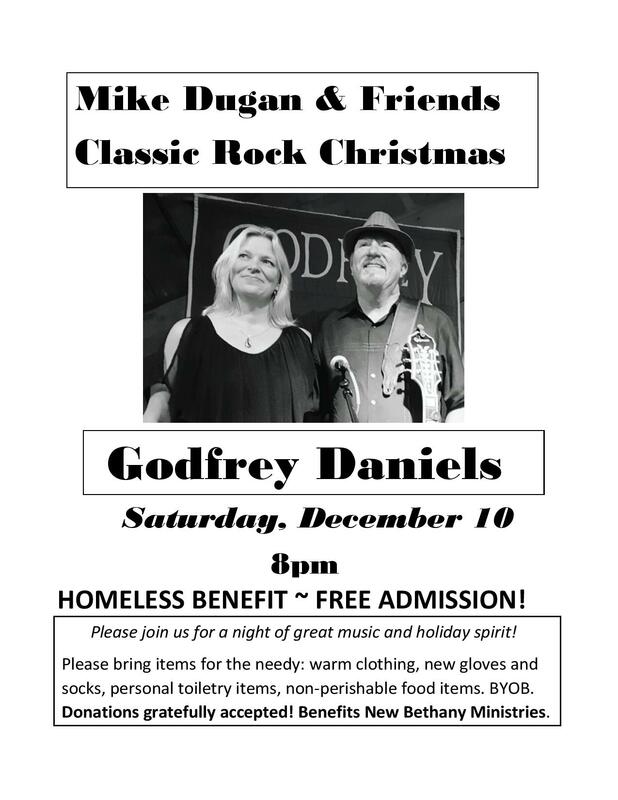 So mark your calendars for Saturday, December 9, 2017 for our next CHRISTMAS BENEFIT CONCERT AT GODFREY DANIELS!!! ANNOUNCING A CLASSIC ROCK CHRISTMAS SHOW TO BENEFIT THE HOMELESS! SATURDAY, DECEMBER 10 in the Christmas City of Bethlehem, PA! FREE ADMISSION! 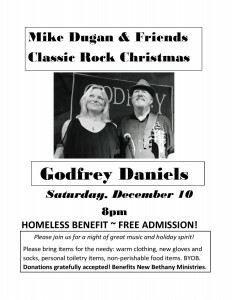 Please join us at Godfrey Daniels Saturday, December 10 at 8pm! BYOB. Please bring donations of warm clothing, new gloves/socks, and personal toiletry items for the homeless. We will be playing our best selection of Christmas and Classic Rock tunes to ring in the holidays! Thank you and have a wonderful holiday season! MUSIKFEST 2016 is gonna be a BLAST with MIKE DUGAN AND FRIENDS commanding the Americaplatz stage on MONDAY AUGUST 8 at 7pm!! We are super excited about the great show we have in store for you this year!! Come early for a good spot on the lawn, bring your dancing shoes, and don’t forget your Musikfest mug!! We can’t wait to rock AMERICAPLATZ!!! 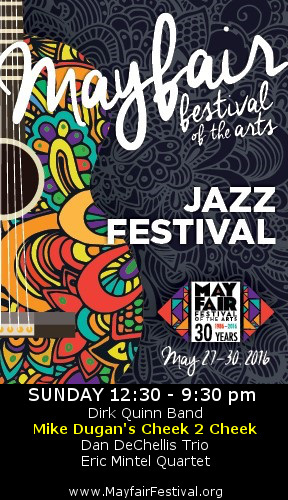 CHEEK2CHEEK is proud to return to the MAYFAIR JAZZ FESTIVAL on SUNDAY, MAY 29! We play from 2:30-4:30pm. Come early and stick around for the Eric Mintel Quartet! Announcing our newest offering: HOUSE CONCERTS!! Do you like to entertain? Have room for 20 or more guests? Want to gain some bragging rights as the best party hosts in town?? How would you like to have Cheek2Cheek play a private concert AT YOUR HOUSE, at little or no cost to you? You put out some snacks, your guests pay a cover charge and bring a bottle of wine, and everyone enjoys an evening (or afternoon) of good company and great music!! Email Jenn for details: scorpiomoon2013@gmail.com. We started marketing this concept on our Southern tour this past winter, and everyone loved it!! It was a big hit with friends and fans, and we like it too!! 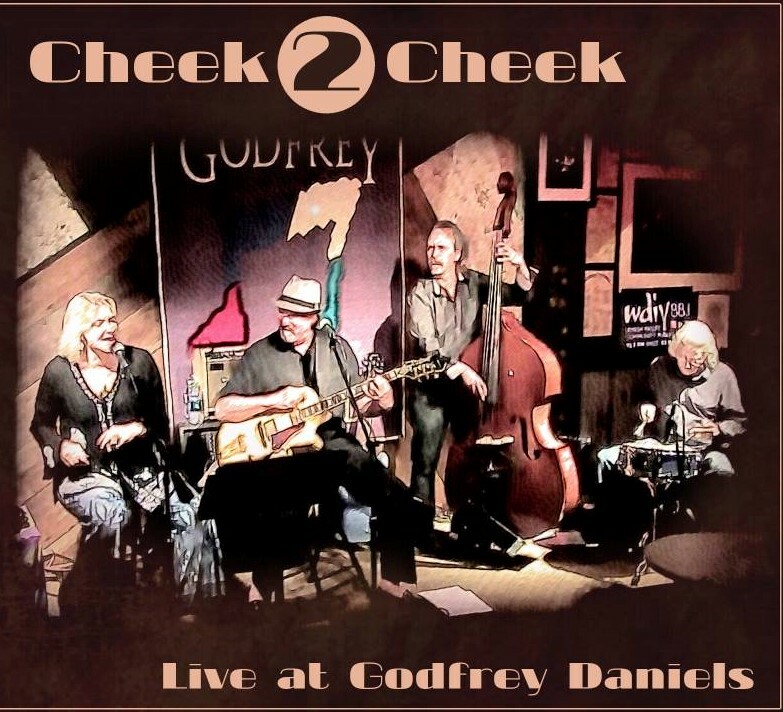 We’d like to express our sincere gratitude to everyone who made our CHEEK2CHEEK CD RELEASE PARTY at GODFREY DANIELS a huge success!! Thank you, thank you!! We couldn’t have asked for a better night. A sold out show with a room full of attentive listeners makes it easy for us to make magic!!! Thanks again for all the love and support. If you missed the show, you can still get our new CD at any of our upcoming gigs, or order online from our CD page(coming soon)! SATURDAY, APRIL 23 AT GODFREY DANIELS – SOLD OUT!!! HAPPY HOLIDAYS FROM ALL OF US AT MCD MUSIC!!! POST-THANKSGIVING NOTE: Oh, what a night!! That was one heck of a show!! Our thanks to Artsquest and Philly Funk for cohosting the best dance party in the Valley!! We hope to do it again next year! Video to follow, stay tuned!! Get ready for one very FUNKY THANKSGIVING PARTY JAM!! DUGAN THOMAS and the PHILADELPHIA FUNK AUTHORITY will be RAISING THE ROOF TOGETHER at MUSIKFEST CAFE at Steel Stacks on FRIDAY, NOVEMBER 27!! Get ready to DANCE and get your tickets early, this show will sell out!! Tix at www.artsquest.org. 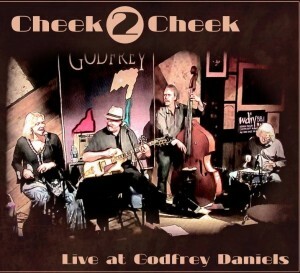 CHEEK2CHEEK JAZZ QUARTET LIVE AT GODFREY DANIELS! SATURDAY, SEPTEMBER 19 AT 7PM tickets available NOW at www.godfreydaniels.org !! COME BE A PART OF OUR LIVE CD/DVD RECORDING at the Lehigh Valley’s original and best listening room!! CAN’T WAIT TO SEE YOU AT GODFREY’S!!! 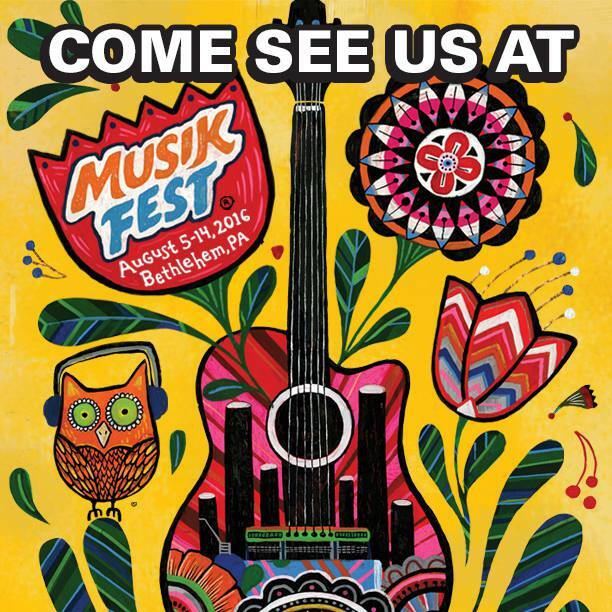 MUSIKFEST 2015 is here! DUGAN THOMAS will be lighting up the AMERICAPLATZ stage at LEVITT PAVILLION on Saturday, August 15 at 7pm. FREE SHOW!!! Come out and dance on the lawn, or just kick back and enjoy as we jam beneath the iconic STEEL STACKS at the World’s largest free music festival!! 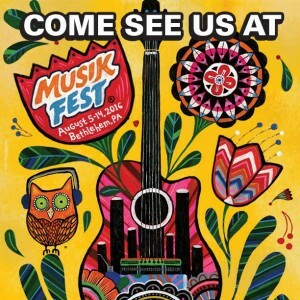 SEE YOU AT MUSIKFEST!! We are excited to announce our first appearance at the Sourland Music Festival on July 18! DUGAN THOMAS plays at 7pm, followed by Canned Heat. The festival starts at 3pm with music, food and drink, arts, crafts, hot air balloon rides, and much more. Fun for the whole family! Proceeds benefit the Sourland Conservancy. OUR FANS SAVE $5 ON ADMISSION – ONLINE ONLY!!! Enter promo code DUGAN when ordering tickets online at www.sourlandmusicfest.org for your fan discount!